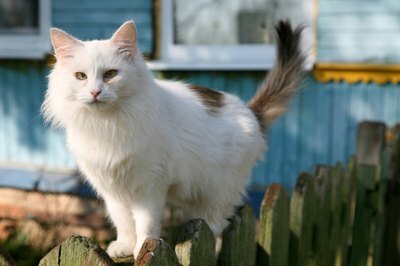 Train your kitty to stay inside your fence line while she's outdoors. Some felines love going outside and roaming an ever-expanding territory while other cats yowl and scream in fright as soon as you take them right outside the back door. While it can be dangerous to allow your feline friend to roam at will, some outdoor recreational time, if supervised, can add to her health. A combination of targeted training and fence modifications can help keep kitty safe. Your feline can benefit from safe, supervised time outdoors. Getting out of four walls and sniffing the dandelions, grass and flowers, as well as nibbling the grass, benefits her mental and physical health. If she has been allowed to spend time outside, she may also be able to find her way home should she get out when you don’t want her to. Train her to go outdoors and come back inside only when you can be physically present to monitor and direct her. It’s not enough to just install a cat door, believing that she’ll come in when she’s ready. Just like a child, she’ll get caught up in playing with neighbor cats she considers friendly, chasing insects or just roaming. Then, you’re standing outside, calling her name and getting worried. Your kitty will need more than just a fence to stay in your yard. A consistent training program in combination with a good fencing system is necessary. Your cat can be an independent thinker -- during a training session, she could decide it's time to run down the street, chasing a low-flying bird. If you live on a busy street, this could be dangerous. A training program with well-defined steps, rewards and discipline can help you keep her safe. You may need to use disciplinary methods you don’t like should your feline keep pushing her boundaries. These methods could include catching your cat and taking away her outdoor time. When you have her back in your yard, cradle her in both arms and take her inside right away. She has to learn running away is wrong. If your kitty is one who loves going outdoors to play, catch birds and chase butterflies, she may not realize that the truck barreling down the street at 45 mph could kill her. It’s up to you, pet parent, to make it safer for her to roam in a limited area. Your cat has some bodacious bounding abilities, making it a challenge for you to keep her inside even a 10-foot-tall yard fence. You’re probably scratching your head, wondering how to keep her inside that fence surrounding your yard. Creating a U-shaped fence topper that still allows her to climb your fence without being able to jump over the top and into your neighbor’s yard is a simple alternative. A small-gauge netting -- with mesh smaller than 3/4 of an inch -- when strategically placed around your yard, can add to your pet's safety while allowing her to play outside. Place the netting so it covers wide openings, such as where the fence door connects to the post. Your cat might do better as an indoor-outdoor kitty, but she needs to be able to explore a defined outdoor area that has been made safe for her. Work on safety for your feline by searching for her favorite escape hatches and tightening them up. If your kitty is truly determined to get outside, you might have to install a small-gauge wire screen all across the top of your fence, covering your entire yard. Use this screen to add to your outdoor gardening and allow trailing plants to grow across it. Make sure these plants aren’t poisonous to pets in case your kitty decides she needs a snack. Why Do Cats Roll Around in the Dirt?